1. King of Israel who dethroned Zechariah, the last of Jehu's dynasty, and succeeded him. He was in turn dethroned by Menahem (II Kings xv. 10-16). 2. Son of Josiah, King of Judah (Jer. xxii. 11). Probably the term is used merely as an epithet = "the desired one"; hence I Chron. iii. 15 makes Shallum the fourth son of Josiah. 3. Husband of Huldah, the prophetess (II Kings xxii. 14). Even at the time of the prophet Elisha, Shallum was one of the most eminent men ("mi-gedole ha-dor") in the country. Yet he did not think it beneath his dignity to lend personal aid to the poor and the needy. It was one of his daily habits to go outside the gates of the city in order that he might give water to thirsty wanderers. God rewarded him by endowing him and his wife Huldah with the gift of prophecy. Another special reward was given him for his philanthropy, for it is he who is referred to in II Kings xiii. 21, where one who was dead awoke to life after being cast into Elisha's sepulcher and touching the prophet's bones. A son was granted him, who became distinguished for exceeding piety—Hanameel, Jeremiah's cousin (Jer. xxxii. 7; Pirḳe R. El. xxxiii.). In Sifre, Num. 78 he is expressly designated as a prophet, David Luria's emendation of the passage in note 59 to the Pirḳe being, therefore, justified. Shallum and his wife were descendants of Rahab by her marriage with Joshua (Sifre, l.c. ; Meg. 14b). 4. A Judahite (I Chron. ii. 40 et seq.). 5. A descendant of Simeon (ib. iv. 25). 6. A high priest; son of Zadok (ib. vi. 12-13; Ezra vii. 12). 7. A son of Naphtali (I Chron. vii. 13; "Shillem" in Gen. xlvi. 24 and Num. xxvi. 49). 8. Ancestor of a family of gatekeepers of the sanctuary (I Chron. ix. 17; Ezra ii. 42 = Neh. vii. 45). 9. A Korahite gatekeeper (I Chron. ix. 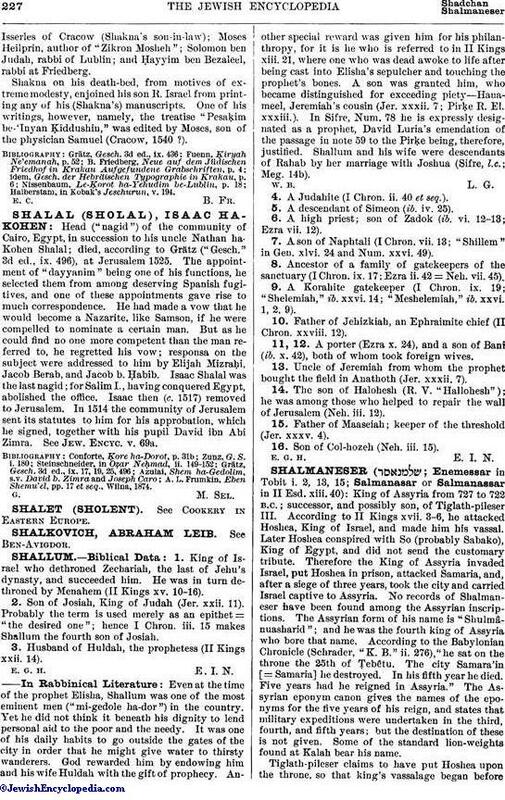 19; "Shelemiah," ib. xxvi. 14; "Meshelemiah," ib. xxvi. 1, 2, 9). 10. Father of Jehizkiah, an Ephraimite chief (II Chron. xxviii. 12). 11, 12. A porter (Ezra x. 24), and a son of Bani (ib. x. 42), both of whom took foreign wives. 13. Uncle of Jeremiah from whom the prophet bought the field in Anathoth (Jer. xxxii. 7). 14. The son of Halohesh (R. V. "Hallohesh"); he was among those who helped to repair the wall of Jerusalem (Neh. iii. 12). 15. Father of Maaseiah; keeper of the threshold (Jer. xxxv. 4). 16. Son of Col-hozeh (Neh. iii. 15).